Although you can treat this as a magic trick, it is really an illusion, and the only trickery is happening inside your head!Our version consists of what appears to be three boxes of playing cards. Ask a volunteer to pick up all three decks, and it will feel to them that the weight of the three decks is exactly what they would expect it to be. If you then ask them to just pick up the top box of cards, they will tell you that it is heavier than all three packs put together! In fact, this is not true. It just seems to be true. And it is a very powerful illusion.How does it work? When we pick up any kind of object, we already have some preconceived idea in our head of how much we expect it to weigh. Now these packs of cards are arranged so that the bottom two decks are filled with Styrofoam, and are extremely light. The top pack has a piece of mild steel inside, and weighs as much as three decks of cards.Now when you lift all three decks, you have an idea in your mind how much they should weigh, and that idea pretty much matches what happens when you pick them all up. However when you pick up the top pack, you are expecting it to weigh about a third of the total weight. In fact it is almost exactly the same weight as the three packs, it is just ever so slightly lighter. However because your brain is expecting it to be so much lighter, it appears that the single pack is much heavier than the three packs combined. Even when you know how it works, it still fools you!This illusion is called the Charpentier illusion, and it was discovered in 1891. So it has been fooling people for a long time!The traditional explanation said that because we expect the larger item to be heavier, we simply exert more force to lift it. However work by J. Randall Flanagan and Michael A. Beltzner at Queen's University, Ontario, Canada showed that something quite complicated is happening. They found that when people repeatedly lifted equally heavy large and small boxes, they quickly learned to exert the correct force so that they could lift each box a controlled distance, in other words their sensorimotor system could learn very quickly how heavy each box really was. However their cognitive/perceptual parts of the brain still reported that the smaller box was heavier! So two different parts of the brain basically are thinking different things. How strange is that? ?http://psyc.queensu.ca/~flanagan/papers/FlaBel_NN_00.pdfIf you want to use this as a magic trick, you can make up a small box - Tim shows one labelled the 'anti-gravity box' in the video- and sit the cards on top; or you can pretend to be fiddling with magnets under the table; there are many ways you can dress this up. We supply three boxes from genuine Bicycle decks of cards. They will all be the same colour; and may either be all red boxes, or all blue ones. Two boxes are filled with styrofoam, and are very light, the third box has a piece of mild steel inside, plus a bit of styrofoam to stop it moving around. (we do not supply any playing cards)The magician Charlie Frye wrote a piece about this illusion in the Journal of Magic Research, Issue 6, January 2015. IMPECCAXBLE CONDITION ON ARRIVAL DUE TO CAREFUL PACKING AND EXCELLENT SERVICE. 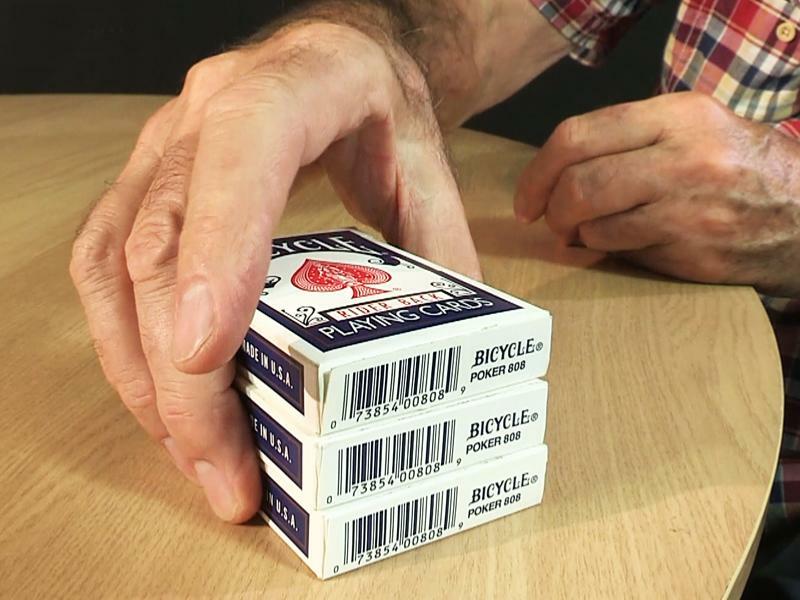 This is a great portable illusion that stills fools me, even though I know how it works! I plan to try it out with my friends and co-workers :-).